Nominated by Benjamin Harrison on March 24, 1892, to a seat vacated by Nathaniel Shipman. Confirmed by the Senate on March 28, 1892, and received commission on March 28, 1892. Service terminated on February 27, 1902, due to appointment to another judicial position. Nominated by Theodore Roosevelt on January 15, 1902, to a seat vacated by Nathaniel Shipman. Confirmed by the Senate on January 21, 1902, and received commission on January 21, 1902. Service terminated on June 2, 1907, due to death. 13.25 linear ft.; finding aid; correspondence. The Honorable William Kneeland Townsend (1848-1907); artist unknown; Oil on canvas; ca. 1900; Lillian Goldman Law Library, Yale Law School, New Haven, Conn., ref. #: U.1900.10. Reference image courtesy of the Office of Public Affairs, Yale Law School. Further reproduction prohibited without permission of the Office of Public Affairs. 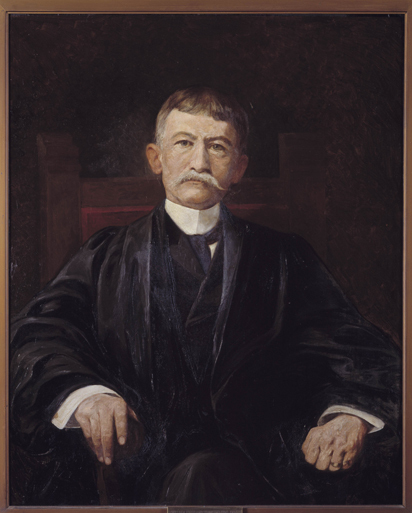 William Townsend; artist unknown; Oil on canvas; n.d.; Richard C. Lee U.S. Court House, U.S. District Court for the District of Connecticut, New Haven.